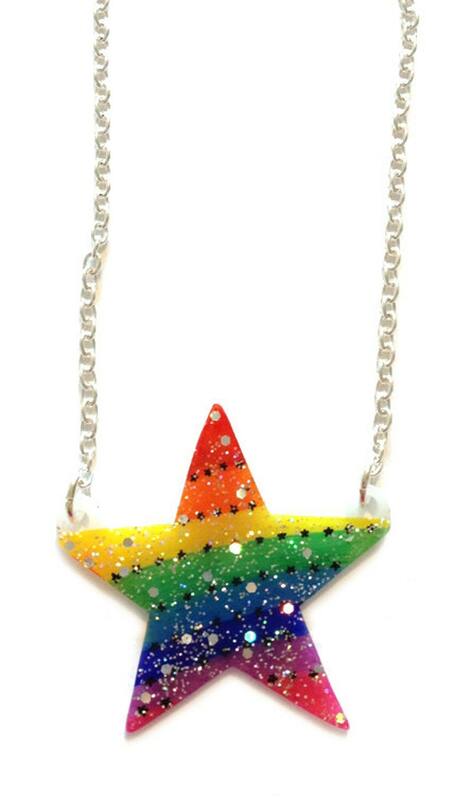 Rainbows are one of my favourite things, and stars are another... so this necklace is perfect! 8 coloured stripes represent all the colours of the rainbow (and pink!). Between each colour is a row of teeny tiny stars. AND - one side is covered in sparkly glitter in two different sizes! The glitter shines with a holographic rainbow effect in the light. It just doesn't get any cuter than this. The glitter will not flake or rub, it has a smooth finish. Your star will be suspended in the middle of a 16" trace chain, with a 2" extension chain.